In the very first days of 2011, Becky Lang, Katie Sisneros, and I started a pop culture and creative writing blog we called The Tangential (after considering a few other names). Five years later, we decided to pat ourselves on the backs by giving our readers a gift (that they can buy for themselves). 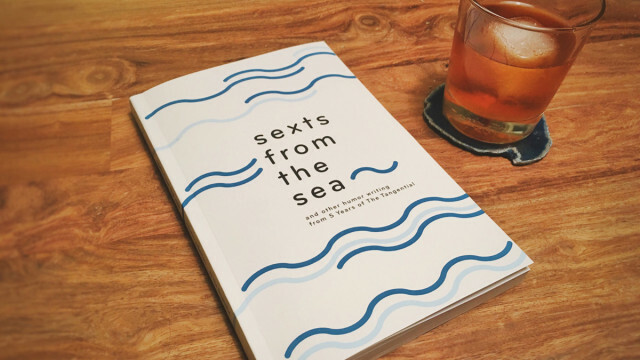 It’s called Sexts from the Sea, and it’s a book collecting over 100 of our funniest posts — including writing by ourselves and by several of our awesomest collaborators. It’s available for Kindle and in a beautiful paperback edition with a cover designed by Caroline Royce. If you buy the paperback, you get the e-book for free! Here’s what the back cover says — and why would it lie? Culled from thousands of satirical, pointed, sometimes absurd blog posts, Sexts from the Sea collects over 100 of the funniest pieces ever published on The Tangential — a pop culture and creative writing blog that just celebrated its fifth anniversary. In addition to the best humor writing by The Tangential’s co-founders Becky Lang, Jay Gabler, and Katie Sisneros, Sexts from the Sea also includes funny stuff from Courtney Algeo, Linnea Goderstad, Amina Harper, Katya Karaz, Sarah Lansky, Dunstan McGill, Lisa Olson, Heidi Schatz, Chrissy Stockton, Chris Vondracek, Emily Weiss, and Jason Zabel.